Jonathan Caverley challenges our image of democracies – and mass publics – as being relatively averse to war. The costs of war, he correctly argues, are not distributed evenly across all citizens. Those who are taxed less heavily than others or do not serve in the military, he reasons, will be less averse to war and will support more aggressive foreign policies, favor more military spending, prefer more capitalized armies that substitute equipment and technology for individual soldiers, and fight insurgencies inefficiently. He tests this argument using public opinion surveys linking income to attitudes and case studies of the expansion of the franchise in nineteenth-century Britain and the overly capitalized wars fought by the United States in Vietnam and Israel in southern Lebanon. This is an original and insightful contribution to the literature on war and international security more generally, and is an outstanding example of how mixed-method research designs are often more persuasive than any single method design. It deserves a broad audience, especially as it appears that the United States and others will be confronted with many ‘small wars’ and insurgencies in the years ahead. If Caverley is right, we are doomed to fight these wars badly and ineffectively. Jonathan D. Caverley. Democratic Militarism: Voting, Wealth, and War. New York: Cambridge University Press, 2014. ISBN: 9781107063983 (hardcover, $94.99); 9781107667372 (paperback, $34.99). Caverley begins with the Meltzer-Richard model from Public Choice Economics. The intuition behind this theory is that the median voter is less wealthy than the mean (average) citizen, and will — all else remaining constant — favor policies that redistribute income from rich to poor. Reversing the lens, Caverley argues that the median voter will tax the rich for defense and will support, as a result, more defense spending and militaries that use more dollars per soldier. Overall, median voters will benefit from the problem of moral hazard: not bearing the full costs of their favored policies, median voters will accept more risk than would otherwise be optimal, with the effect of driving the country to greater military spending and more aggressive foreign policies than it ‘should’ pursue. This effect, moreover, will increasing in the level of income inequality within a country. This argument does not overturn – nor even challenge – the democratic peace hypothesis, though Caverley implies as much in his Conclusion. Meltzer-Richard’s theory applies only in democracies where voting is the only means of selecting a leader or policy. Autocracies may suffer from the moral hazard problem to an even greater extent. Even if the autocrat is the richest person in the country or his support coalition is disproportionately drawn from the rich, in the absence of democratic pressures the autocrat will not bear the costs of war and will either a) tax the poor or impress them into military service or b) disproportionately benefit from bargaining over the issue at stake. In autocracies, in short, Meltzer-Richard is likely to operate in reverse, in which the median member of the ‘selectorate’ is rich and taxes fall disproportionately on the poor. If so, then the rich will favor more defense spending, be more aggressive, prefer labor-intensive (rather than capital-intensive) military strategies, and so on. Although Caverley may be correct in pointing to the possibility of aggressive behavior by democracies, autocracies are likely in my view to remain even more aggressive. In this symposium, three excellent reviewers also point to several reasons why the median voter theorem might not dominate foreign-policy decision-making. Christopher Coyne suggests that special interests may trump the median voter on any given issue, and institutions shape the costs of political action. Elizabeth Saunders highlights the salience of issues for voters, including the well-known observation that the median voter in most advanced industrialized democracies does not pay much attention to foreign policy. This opens the possibility, she proposes, for elite manipulation of popular opinion and independent decision-making by presidents and prime ministers. Pascal Vennesson points to problems with the median voter theorem in general, and – drawing on behavioral economics – questions whether voters really reason the way the theory requires. While all applaud the novelty and insights of Caverly’s argument, and compliment the substantial empirical research presented in the book, each reviewer suggests important limits to the analysis and the need for a fuller theoretical and empirical account. Building on Vennesson’s critique of rational choice theory, I also want to point out that Meltzer-Richard’s theory, though logically deductive and sound, receives relatively little support in empirical studies of other, non-military issues areas. In most democracies, it is not clear that the median voter is taxed disproportionately less or benefits disproportionately more from public policy. Income tax rates may be progressive, but consumption taxes, payroll taxes, and so on mitigate this imbalance. Similarly, while social welfare policies disproportionately benefit the poor, corporate welfare policies benefit the rich and various tax expenditures benefit the middle class (e.g., mortgage interest deductions). How much redistribution actually occurs in advanced industrialized democracies remains a very contentious issue both in the academy and the popular press. The main explanation for why Meltzer-Richard does not receive significant empirical support despite its elegance is that voting, echoing Coyne and Saunders, is not the only form of political participation or influence. Even within one-person, one-vote political systems, the rich may exert disproportionate influence through campaign contributions, access to the media and other forums, or through the structural power of capital (e.g., threatening a ‘capital strike’ or more likely capital flight). The important question for Caverley’s argument, however, is why should Meltzer-Richard hold for security policy when it does not appear to hold in other issue areas? Despite its theoretical elegance, the foundation on which this book is built is shaky. The empirical evidence presented by Caverley is impressive, but we should be cautious in accepting the theory’s causal argument. Given the transnational insurgencies the advanced industrialized democracies now face around the globe, we should all hope the counter-insurgency mistakes in Vietnam, Lebanon, and the more contemporary cases of Iraq and Afghanistan are simply that – mistakes from which we can learn – rather than the inexorable fate of democracies. Jonathan D. Caverley is a Research Fellow at the Woodrow Wilson Center for International Scholars and a Research Associate in Political Science and Security Studies at the Massachusetts Institute of Technology. He is currently completing a book manuscript entitled “Arms for Influence: The Global Arms Trade and the Future of U.S. Power,” with Ethan B. Kapstein. David A. Lake is the Jerri-Ann and Gary E. Jacobs Professor of Social Sciences and Distinguished Professor of Political Science at the University of California San Diego. His most recent book is The Statebuilder’s Dilemma: On the Limits of Foreign Intervention (Cornell 2016). Christopher Coyne is an Associate Professor of Economics at George Mason University and the Associate Director of the F. A. Hayek Program for Advanced Study in Philosophy, Politics, and Economics at the Mercatus Center. He is the Co-Editor of The Review of Austrian Economics, The Independent Review, and Advances in Austrian Economics. He also serves as the Book Review Editor for Public Choice. Elizabeth N. Saunders is an Assistant Professor of Political Science and International Affairs at George Washington University, and for 2015-2016, a Stanton Nuclear Security Fellow at the Council on Foreign Relations. Her research and teaching interests focus on international security and U.S. foreign policy. Her book, Leaders at War: How Presidents Shape Military Interventions, was published in 2011 by Cornell University Press and won the 2012 Jervis-Schroeder Best Book Award from APSA’s International History and Politics section. Her research has also been published in journals including International Security, International Studies Quarterly, the American Journal of Political Science, and Security Studies. Pascal Vennesson is Professor of Political Science at the S. Rajaratnam School of International Studies (RSIS), Nanyang Technological University, Singapore. His research and teaching lie at the intersection of the fields of international relations and strategic studies. He is the author, co-author and editor of six books and his refereed articles have been notably published in Armed Forces and Society, International Relations, The Journal of Strategic Studies, The Review of International Studies, Revue française de science politique (French Political Science Review) and Security Studies. The journalist H.L. Mencken summarized democracy as “the theory that the common people know what they want, and deserve to get it good and hard.” Mencken’s description nicely captures the essence of Jonathan Caverley’s important book, Democratic Militarism. Caverley’s contribution is to focus on the role that voters in democratic systems play in the decision to engage in military adventures abroad. As he rightly notes, discussions of democratic militarism have usually neglected the role of voters, focusing instead on members of the military, the political elite, bureaucrats, and special interests. By studying the role of voters in democratic decision making as it relates to war, Caverley fills an important gap in our understanding of why democracies engage in war. In doing so he undercuts the conventional, romantic view of democracies as being less likely to engage in, and remain in, unnecessary foreign military interventions. At the core of Democratic Militarism is the well-known median voter theorem which holds that under a majority-rule voting system, the winning outcome will be that which is preferred by the median voter. The power of Caverley’s analysis is that he applies this straightforward theory to an important topic, generating broad, and often counterintuitive, findings. Relying on both quantitative and qualitative evidence, he demonstrates that the median voter matters because of his ability to exert influence on the decisions of elected officials regarding foreign policy. In general, the median voter will favor more war as the cost of war-making falls, all else being constant. There are two factors that influence war-making. The first is the process of military capitalization which reduces the chance of causalities in war. As a military becomes more capital-intensive, the cost to the median voter falls since there is less reliance on social mobilization. The second factor is income inequality, which allows the median voter to use the government provision of ‘defense’ (i.e., war making) as a means of redistribution. The costs of war are spread across the electorate with the relatively wealthy shouldering the greatest burden. This means that median voters will support more war making than is socially optimal, since they do not incur the full cost of doing so. Democratic Militarism raises a host of important issues for political scientists and economists concerned with democracy, international relations, and war. I will focus the remainder of my comments on some issues related to the intersection of ideas and interests. As Caverley notes, many treatments of democratic militarism focus almost exclusively on the role of specific interests—e.g., the military-industrial complex—while neglecting the ideas, or preferences, held by voters. His contribution is to study how the preferences held by the median voter influence the decision to engage in, and perpetuate, war. It is important to emphasize that ideas and interests are not necessarily at odds for explaining political outcomes. Politicians must make policy decisions in the context of a given climate of political opinion shaped by the preferences of the median voter. However, within that climate, there is often significant space for interest groups to shape the specifics of how policies are implemented and executed. The median voter may want more war, but the specifics of how war-making takes place leave much room for influence by special interests. To provide a specific example, Northrop Grumman, an American-based global defense company, was able to use political connections and lobbyists to ensure that production and use of its Global Hawk Block 30 drone continued despite operating flaws and suggestions from the members of the Air Force that it be discontinued. As this illustrates, special interests can operate within a given climate of voter preferences to shape outcomes which benefit their own narrow interests. Interests matter in another way as well. As Caverley makes clear, in a democracy voters play a crucial role in political outcomes. However, the preferences they hold must come from somewhere, and various interests often play a central role in shaping the ideas held by citizens. For example, John Mueller analyzes how an entire terrorism industry emerged in the wake of the 9/11 attacks. The participants in this industry—government bureaucrats, private consultants, terrorism experts, etc.—have an incentive to overstate the terrorist threat in order to expand and self-perpetuate. In this way special interests are able to influence the preferences of the median voter for war-making which are then revealed to elected officials at the voting booth. The ability of various interests to influence voter preferences is magnified in the context of foreign policy, where information is limited and often purposefully kept classified under the guise of maintaining national security. It is also important to note that not all aspects of war-making are subject to the control of elected officials and, hence, the median voter. The legal scholar Michael Glennon has documented how a “dual government” has evolved in the U.S., with the national security state being not only outside of direct public view, but also outside of the control of the executive, legislative, and judicial branches. To the extent that this is accurate, median voter preferences are largely irrelevant for national security and war-making outcomes because the link between voters and elected officials, and between elected officials and foreign policy outcomes, is severed. Another issue deals with the pre- and post-constitutional stages of analysis which have been highlighted by scholars such as the Nobel Prize-winning economist James Buchanan. The pre-constitutional stage of analysis deals with ideas regarding what a good and just society entails. As such, it involves forming some kind of consensus regarding the meta-rules which will structure subsequent social interactions. The post-constitutional stage involves the strategic behavior of those individuals acting within the established meta-rules. Democratic Militarism is clearly situated in the post-constitutional category of analysis, but Caverley’s analysis also has implications for the pre-constitutional stage as well. While he doesn’t offer much in terms of the mechanisms for overcoming sub-optimal war making in democracies, one solution would entail changes to the rules governing political behavior as it relates to war making. For example, a change to the rules that raises the costs of war-making for the median voter would, all else being constant, reduce the demand for foreign interventions. Likewise, a rule that limited what elected officials could do in regards to foreign intervention would limit what the median voter could demand from their representative. In the pre-constitutional stage, ideas matter not so much in terms of specific policy preferences, but rather in terms of what are seen as good overarching rules regarding the role of the state when it comes to matters of security, defense, and war making. Understanding how people will act in the post-constitutional stage, which is what Democratic Militarism does, is a crucial input to developing meta-rules which limit undesirable behaviors. None of these points are intended as critiques of Caverley’s analysis. Rather, they represent just a few of the many open areas of inquiry emerging from his analysis. Caverley is to be complimented for making an important contribution to our understanding of democracy and war. His analysis contributes to a more realistic understanding of how democracies operate in the context of foreign policy. In doing so he highlights a major flaw in democratic political institutions—namely, that the median voter has an incentive to support war making even when the (social) costs exceed the (social) benefits. Recognizing this reality is an important first step for a more complete understanding of the relationship between democracies and war. Determining mechanisms that either align the private benefits of the median voter with the social costs of war making, or which tie the hands of elected officials even when the median voter demands more war, is what is ultimately necessary for remedying the situation. Caverley’s argument is simple, and yet also theoretically sophisticated. He posits that the key force in shaping how democracies select and fight their wars is the voter—specifically, the ‘median voter,’ a character often exploited and sometimes derided by political scientists. When the median voter is able to shield herself from the human or financial costs of war, then war becomes relatively more attractive as an option, increasing the propensity for democracies to fight. Two factors influence what Caverley calls “internal cost distribution”: economic inequality, which encourages a relatively poorer voter to tax the rich in order to fund military power; and military doctrine, which can lower the physical risk to soldiers if it leans more heavily in the direction of capitalization (as in the case of doctrines that emphasize technology or armored vehicles, for example) (28). Put simply, the median voter cares about “death and taxes” (29). Caverley’s central thesis is that the more the median voter can “lighten her burden of war” by shielding those who fight from harm and redirecting financial costs toward the rich, the more prone a democracy will be to engage in aggressive foreign policy (31). The book has many strengths. It has the virtue of addressing not only whether but how states fight, with a particular emphasis on military doctrine. The choice of doctrine (and subsequent military strategy) has been critical and controversial in most of the United States’ military efforts in the post-World War II era, including the wars in Vietnam, Iraq, and Afghanistan. Caverley argues that the nature of military strategy will be affected by the distribution of costs. To the extent that democracies are able to shield the median voter from the costs of war through taxation and capitalization, voters will simultaneously approve of fighting and also support strategies that are ultimately ineffective for the task at hand, as in the case of fighting a counterinsurgency with a capital- and fire-power intensive strategy rather than the troop-heavy approach favored by many counterinsurgency theorists. Caverley does not confine himself to an analysis of the United States, however, nor does he stay within the post-1945 period so familiar in these debates. He covers the British Empire, as well as the domestic politics of national security in Israel. The book’s emphasis on inequality also resonates with current debates about how a highly skewed distribution of wealth shapes democracies. The debate over the nature and effectiveness of democracies at war dates back to Thucydides, and so it is worth pinning down precisely where Caverley’s argument fits in the long history of scholarship in this vein. The pendulum of thought on democracies and foreign policy has swung many times, from the pessimism of Thucydides to the liberal optimism of Immanuel Kant, and back to the pessimism of Alexis de Tocqueville, and later, George Kennan. Since the end of the Cold War, however, a significant strand of research in international relations has built up around the idea that democracies have advantages in the international arena, especially (though not exclusively) in selecting and fighting wars. Although scholarship in this tradition contains a variety of arguments, most share a focus on the salutary effects of accountability to a voting public. This ‘democratic advantage’ thesis has recently come under fire from several directions, however. Some have taken an empirical approach, arguing that previous findings do not hold up when the record is further scrutinized. There has also been a welcome expansion of research on how authoritarian regimes make foreign policy and fight wars. This research, including recent books by Jessica Weeks and Caitlin Talmadge, has begun to fill a large hole in international-relations scholarship that compares the nature of war across different forms of governance. Many of these arguments suggest that democracies and at least some authoritarian regimes behave similarly in times of war, or at least that the outcomes of their decisions are more similar than the ‘democratic advantage’ school argued. Collectively, this scholarship has suggested that democracies may not have an edge in selecting wars prudently or in military effectiveness when wars do occur. There has been comparatively little work reassessing the nature of foreign policy and war in democracies, although Caverley’s book contributes to a growing effort to change that. This debate is not purely academic: in light of the recent record, not only in the United States but also in Israel, of difficult and protracted ‘small wars,’ both scholars and policymakers have a stake in accurately diagnosing problems with how democracies choose and fight their wars. If we stipulate, for argument’s sake, that there is collective merit in the stream of recent findings that democracies and some authoritarian regimes produce similar wartime results, there are several possible paths to understanding whether democracies are ‘better’ at war and peace and whether recent wars are anomalous or representative. One is to shift the focus away from voters to elites or media, who are often the access points through which voters gain information. Indeed, a recent book by Matthew Baum and Philip Potter does just that, showing how access to media and political debate through parties affects whether publics can hold democratic leaders accountable for their wartime decision-making. Some scholars go further, as John Schuessler does in another recent book, arguing that elites manipulate and even deceive the public. Caverley eschews these elite-based arguments and takes a different path to reassessing democracies and war, laying the blame for democratic aggressiveness and strategic problems in small wars squarely at the door of the voters. He thus tackles ‘democratic advantage’ arguments on their own terms, keeping the voters at the center of the story. For Caverley, democracies are often militaristic and fight with ultimately ineffective strategies not because elites mislead the public, but rather because the voters want it that way. This is an important argument and one that anyone writing on democracies and war will have to confront. It takes seriously not only the economics of defense, taxation, and inequality, but also the interaction between states at the international level. Pulling all of these moving parts together is no mean feat. One aspect of the argument where Caverley is less successful, however, is in distinguishing between what he calls the “strong” and “weak” versions of his argument. The “weak” version posits that cost distribution is merely a “permissive condition: with no skin in the game, the voter passively allows the executive…to conduct the state’s foreign policy, including war, as it sees fit.” In the “strong” version, however, “the median voter may exert sufficient pressure on leaders to pursue the public good of security more aggressively.” Caverley himself notes that the “weak” version “may be more plausible because the average voter generally does not pay much attention to foreign policy, and her opinions are strongly shaped by the executive and other elites.” He posits that if “increased capitalization merely removes a check on the executive, we should see more variance in conflict behavior, but not necessarily an increase”—i.e., similar wartime behavior across democracies and authoritarian regimes, rather than what Caverley calls “democratic militarism” (42). These two arguments are quite different—more different, in some ways, than Caverley allows—and as his title suggests, Caverley favors the “strong” version. But he is right to note that the weaker version is the more plausible, given decades of research on voter inattention and deference to elites. The role of elites in influencing public opinion on foreign policy is recognized even by those who see an independent and critical role for voters. Although Caverley presents evidence in support of the strong version of the argument, it is difficult to assess directly the proposition that voters insulated from the costs of war actively push for militaristic policies, since any perceived or stated voter preference for military adventures could be the result of elite leadership of mass opinion. The most interesting and original results on this issue come from the Israeli case, where public opinion data suggests that lower socioeconomic status correlates with increased willingness to use force (223). But it remains unclear how well the Israeli case generalizes, given the unusually high salience of national security issues. In the case of Vietnam, one issue that arises is the somewhat static nature of Caverley’s argument even as policy in Vietnam evolved. In my own work, I have put forward the argument that Presidents John F. Kennedy and Lyndon B. Johnson held distinctly different views about the nature of the threat in Vietnam, and consequently took very different approaches to strategy. Kennedy attempted to use a counterinsurgency strategy that called for deep involvement in local affairs, while Johnson mainly employed the firepower-intensive strategy that Caverley attributes to voter preferences. Ultimately, the military’s resistance to Kennedy’s preference for counterinsurgency had the effect of rendering the actual strategy on the ground quite similar across the two administrations. Caverley suggests that Kennedy’s commitment to counterinsurgency was less than whole-hearted. Yet Kennedy believed, however misguidedly, that counterinsurgency could be attempted with the limited military manpower in place in Vietnam while he was president. Caverley does not delve deeply into the differences between the two presidents’ approaches, instead arguing that U.S. policy in Vietnam displayed significant continuity across the Kennedy and Johnson (and Nixon) presidencies (179). Thus each president responded to the public’s preference for “a capital-intensive approach to limited war as well as an aggressive employment of such a doctrine,” and also “direct[ed] the military to fight accordingly” (178). But if Kennedy’s preference differed from the capital-intensive strategy that Caverley argues the voters wanted and that many have argued the military itself favored, then at least one president tried to shift policy away from what Caverley argues the voters preferred. Given that scholarship on public opinion and Vietnam suggests that the public, while generally supportive of the war up to 1968, did not have particularly strong preferences about it and tended to back the elite consensus, the precise role of the voters remains unclear. Still, Caverley makes a smart and interesting contribution to the debate about the distinctiveness of democracies in the international arena. Although his argument will undoubtedly be controversial, scholars of democracy and foreign policy will have to contend with this argument for some time to come. Caverley’s book challenges not only scholars who focus on elites, but also scholars who see a more traditional, constraining role for public opinion in times of war. Much as many would like to either ignore or laud them, voters will remain, to paraphrase Cowen, at least a part of the problem. On the cover of Jonathan Caverley’s dense and thought-provoking book Democratic Militarism. Voting, Wealth, and War (2014), one finds the 1914 painting “Visual Synthesis of the Idea: “War”” by Italian Futurist Gino Severini. This striking image condenses some of the key characteristics of the industrial war that was just beginning: canons, flags, the wings and propeller of an aircraft, electric pylons, smokestacks and other symbols of a broad national and industrial mobilization. Following the example of French Cubists, Severini integrated texts into his painting; one can read “ordre de mobilisation générale” (order of general mobilization) and “effort maximum.” His painting, which forcefully captures some of the unsettling dynamics of the Great War, does not represent the wars examined by Jonathan Caverley, which are essentially small wars of choice. Yet, it does capture the central starting points of his book: how general is this “general mobilization” for war? And, if instead of being general, it is selective and consequently leads to a partial, not maximum, war effort, what will the strategic consequences be? While Severini left the human presence out of his “visual synthesis” of the idea of war, in order to address these questions Jonathan Caverley puts front and center the median voter in mature and wealthy democracies. The painting on its cover is not the only thing that I like about the book. I am largely sympathetic with his substantive argument and impressed by its rich, often counterintuitive, implications. I remain less convinced by its overstated utilitarian assumptions about human behavior and concerned by the blinders that it generates to analyze what remains a fundamentally political and strategic phenomena such as war. In this review, I highlight first what I see as the important contributions of the book. I then turn to the aspects that I find wanting. These points should be understood more as missed opportunities than dramatic flaws. One cannot do everything in one book. I mention these points more to engage in a dialogue and to provide specific examples of the thought-provoking aspects of Caverley’s theoretical and empirical arguments. Caverley’s work makes an intriguing and stimulating contribution to the study of the effects of domestic politics on international relations. He goes against the grain with alacrity and puts into question a number of well-established empirical and normative assumptions about democracies in international affairs. In a provocative way, he turns the analytical weapons and the logic of liberalism against some of its most cherished behavior and norms. The villain of the book is the darling of many liberal accounts: the median voter, his preferences and influence. While in conventional liberal theories of foreign policy, aggression is rarely the average voter’s fault, Caverley does not let him off the hook (4, 47). The cynical and selfish average voter is as likely to “choose an aggressive grand strategy as any unitary actor or despot (indeed perhaps even more so) as long as she can get someone else to pick up the tab” (2). Because she does her best to “buy more security for herself at the least personal price,” it becomes much more difficult for political leaders to send “costly signals” (208). In fact, the author identifies what one could call the ‘median voter trap’ in which, he claims, democratic leaders are likely to fall. The preferences of the “median voter” (24-25) makes the involvement in counterinsurgencies and other similar armed conflicts more likely, but simultaneously his preferences are such that they impose constraints that will lead to a military strategy which is poorly adapted to these wars. In short, the average voter in wealthy democracies is fine with prolonged and costly wars that are fought by very inefficient and ultimately unsuccessful means (13, 208). To add insult to injury, policymakers are fully aware of the hazards of the type of military strategy that the median voter forces them to implement (for instance waging a capital-intensive campaign in Vietnam) yet they recommend it anyway. Along the way, the author points to troubling conclusions for liberal norms, for example the fact that less costly (for the citizens themselves) imperial action is not incompatible with liberalism and democracy at home and can even help preserve important liberal aspects of political life (170). There is something refreshing in this enthusiastic effort to cut down to size democracies’ lofty ideals and to drown democratic triumphalism in the icy waters of the egoistic and short sighted calculations of the median voter, untrammelled by any concern with the national interest or sound strategy, who holds continuous sway throughout the body politic. The underlying logic of his argument is not new in ‘rationalist’ accounts of the impact of domestic politics on foreign policy choice. ‘Rationalists’ commonly embrace the domestic level of analysis and show divergences between state policy and what is good for the country as a whole. However, the source of these distorted and ultimately suboptimal policy outcomes usually lies in the action of clusters of individuals or small groups who pursue their parochial interest rather than the common good such as a lobby group, a political party, or politicians who seek nothing else but their re-election. By contrast, Caverley highlights not the distorting role of a tiny minority but the impact of the much larger group, the median voter. The very entity that is commonly associated with a more inclusive representation reflecting the aggregate welfare of society as a whole proves to be pursuing its own narrow parochial economic interest like everybody else to the detriment of sound strategic choices. 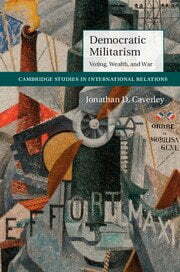 While the work of Colin McInnes, Yagil Levy, Theda Skocpol or Gil Merom, for example, already explored similar trade-offs and challenges of democracies facing military interventions and war mobilizations more generally, Caverley’s adds an intriguing layer to this rich discussion by pointing at the seemingly widespread influence of median voter dynamics. While one may quibble with this or that aspect of Caverley’s theoretical argument or empirical analysis, it is hard to deny that he is onto something significant and influential. The idea that changing forms of political and civic participation shape ways of war has had a long and distinguished intellectual pedigree since Aristotle, Niccolo Machiavelli, Montesquieu and Jean-Jacques Rousseau, and it is a central component of the Republican tradition in political thought. Those deep and multi-layered relations are perhaps easier to observe during periods of strong civic engagement and large popular political participation. Social revolutions, for example, often coincide with intense military mobilization. However, the opposite process, namely the strategic consequences of the de-mobilization or the avoidance strategy of large sectors of societies and their paradoxical strategic consequences, is equally fascinating and remains comparatively less explored. The author is right to draw attention to a long- term process that has indeed shifted the ways in which wealthy democracies face, and ultimately fight, wars. It is also important to note that, while the book, published in the prestigious “Cambridge studies in international relations” series, speaks primarily to International Relations (IR) specialists, its contribution is just as significant (if not more) for the war and strategic studies fields. Caverley’s argument addresses a number of central issues for those who are interested in the changing character of war, and his findings resonate with some of the longstanding concerns of prominent strategic thinkers such as Jacques de Guibert or Carl von Clausewitz on the relations between the characteristics of societies and nations and their ways of war. Indeed, one of the most promising research agendas that Caverley’s work suggests is to examine the violent interactions between polities facing different levels of constraints arising from the ‘median voter’ or even the complete absence of any median voter, including wars involving terrorist groups who seek to represent a political community (208). Albert Hirschman noted long ago that political scientists, notably but not exclusively in the United States, “whose inferiority complex vis-à-vis the tool-rich economist is equalled only by that of the economist vis-à-vis the physicist — have shown themselves quite eager to be colonized (by economists) and have often actively joined the invaders.” Caverley enthusiastically borrows the logic and the vocabulary of economics. His book gives at times the impression to be a sophisticate exercise in applied microeconomics to problems of war and strategy rather than political science. Economic metaphors abound, even when they are either not totally clear or necessarily enlightening. We explore grand strategic “externalities” by decision-makers who do not bear “costs” but shift them to third parties outside of the “transaction” which leads to a situation of “moral hazard” (37). In this realm, states do not really have security and defense policies but “portfolio(s) of investments designed to increase security” (3). The perspective adopted here is anchored in the rational choice tradition and is related to some extent to the ‘bargaining model of war’ although there are no actual strategic interactions between belligerents in the argument. I deliberately avoid the term ‘rationalism,’ which is commonly used in a misleading way in IR, and which refers in fact to a set of traditions of thought which extends way beyond rational choice theorizing. The state’s structural position in the international system, such as its relative power, its geography, the threats it faces, its core ideology, or its identity are not central here. «”Non-rationalist” explanations are also summarily dismissed (47-48). Political leaders do not lead: they are, we are told, mere “transmission belt(s)” and while they really do not want to use force, popular pressure forces them to do so (141, 158). The rational choice analytical framework used here has three limits. First, like many IR theorists, J Caverley puts aside the large body of empirical evidence, notably from cognitive psychology, that shows that people simply do not act as expected by many rational choice assumptions. While many economists have for almost twenty years now, after the development of behavioral economics, recognized that those assumptions cannot be the sole basis of theorizing and empirical work, this important avenue for empirical research is not explored. Ultimately, we do not know empirically if the ‘median voter’ really think and act as postulated by the theory. Neither the public opinion polls examined, nor the case studies which focus on the ways in which political leaders interpret the will of the median voters can provide an answer to this important question. Second, Caverley’s emphasis on the median voter as a structural component of the political environment which acts as a constraint on political leaders does not mean that he examines domestic politics as such. It would have been interesting to further explore the sources of the preference and behavior of the median voter and there are unexplored but potentially fruitful connections with the prominent (yet distinct) arguments of Robert Putnam and Theda Skocpol on the transformation of civic life in the United States. Caverley’s median voter may be somewhat related to Putnam and Skocpol’s arguments about the unravelling of many types of social connections, citizens’ withdrawal from affiliation with voluntary associations, and the displacement of popularly rooted membership associations by professionally managed advocacy groups and non-profit institutions, which has diminished (but not eliminated altogether) the capacity to convert societal resources into military power. These constraints have also favored the resort to military strategy and to means that reduce the extraction of societal resources for military efforts, shaping the advent of a transformed American way of war. Moreover, Caverley paints a bleak picture of a relatively fixed, overwhelmingly influential, median voter but does not discuss cases in which political leaders take positions that diverge from the median voters, a regular occurrence in domestic politics. Similarly, political cleavages, ideologies, and groups’ partisan attachments are often part of political scientists’ discussions of the median voters but are not fully addressed. Specialists of domestic politics often note that the median voter theorem holds in some case but not in others, as agenda-setters exploit, for example, the differences between the median voter’s policy preferences and the actual status quo to articulate a new policy that comes as close as possible to the agenda-setter’s preferences. It is also at times a bit difficult to get a clear sense of who the median voter really is. The term seems to incorporate both the middle-class and the working class (168) but Caverley also explains that the median voter approach claims that democratic foreign policy favors the relatively poor, not the poorest (197, fn 30). Finally, Caverley’s microeconomics-inspired framework does not encourage a substantial dialogue with historians and the study of history. To a certain extent, the book’s historical case studies — especially the late Victorian British Empire and the American way of war in Vietnam — have a tendency to fall in the trap identified by Ian Lustick, who noted that social scientists tend to be selective in their accounts, picking and choosing (not always consciously) the quotes and accounts that accord with the theories they seek to test. This is unfortunate because these two cases are especially well-suited for the strategies he suggested in an effort to check, if not to fully overcome, this common bias. On the topics of both late Victorian British imperialism and the U.S. in the Vietnam War, there exists a rich and long historiographical literature which has generated a number of implicit theoretical arguments that could be fully examined and discussed explicitly. Another option could have been to select a convincing historiographical school that does not run parallel the author’s theory in order to engage in an explicit comparative assessment of two competing interpretations. Setting these disagreements or differences of emphasis aside, Democratic Militarism is a stimulating and important book which offer a new way of thinking about democracies ways of war. IR, strategic studies scholars, and interested general readers alike will have to consider Jonathan Caverley’s insightful arguments very seriously. Democratic Militarism: Voting, Wealth, and War originated in early 2003 as I watched “the new American way of war” unfold in Iraq. Defense Secretary Donald Rumsfeld, eager to demonstrate the potential of the ‘revolution in military affairs,’ aggressively whittled an invasion force down to 160,000 personnel supported by a massive 27,000 aircraft “weapons releases” (not to mention artillery and armor). Dismayed by the policy process leading up to the invasion, and awed by the technology employed during it, I began to consider the joint implications. I defended the resulting dissertation in the aftermath of the ‘surge’ in Iraq where, despite an apparent turn to counterinsurgency, coalition personnel increased by 28% while the number of aircraft-dropped munitions increased by 746%. The Obama administration’s own ‘surge’ in 2011 Afghanistan had a ratio of munitions releases to deployed soldiers eight times higher. As I wrote this ISSF response, U.S. Central Command reported that in 2015 the United States and its allies actually broke the 2003 record with 29,661 weapon launches. The 2015 ratio in Afghanistan is a very high 0.1 weapon release for every soldier. In the Syria-Iraq theatre it is roughly 6.5. The United States is not alone in pursuing an accelerating doctrine of capital-intensive warfare across the globe. The 2011 toppling of Gaddafi in Libya (and the follow-on military operation being mooted right now) was a largely European initiative conducted almost entirely from the air. France has swallowed its defense-industrial nationalism to purchase Reaper unmanned aerial vehicles (UAVs). After an unedifying House of Commons debate, Britain recently initiated air strikes in Syria that will, given the ordnance already coating that country, have no strategic effect. Israel’s deployment of firepower (and its targets’ relative imperviousness to it) has become routine in the Gaza Strip. The idea that, in David Lake’s words, “we are doomed to fight these wars badly and ineffectively” seems to be on firm ground empirically. Democratic Militarism is a first attempt to explain this equilibrium and to suggest why important secular trends in inequality and military doctrine suggest more to come. There remains much to explore about the democratic way of war. I am grateful to H-Diplo/ISSF for inviting me to participate in a roundtable and thank Christopher Coyne, Elizabeth Saunders, Pascal Vennesson, and David Lake for providing such thoughtful feedback. Democratic Militarism employs a stark political economic argument but is designed to reach across other intellectual traditions. It is particularly gratifying therefore that each scholar ably represents a distinct school of thought: public choice economics, elite-centered inquiries into politics, and the sociological approach to strategic studies. And of course David Lake, whose introduction provides some of the roundtable’s toughest criticism, is a founder of what I call ‘democratic exceptionalism,’ which provides the book its very foundation. Democratic Militarism is designed to provoke research as much as to challenge existing work. I therefore wholeheartedly agree with the authors’ calls to move forward along multiple paths. Their feedback can be grouped into a few important themes. After a brief summary, I will address their comments accordingly. The headings are designed to encapsulate these scholars’ excellent suggestions for future work, which I enthusiastically endorse. The long intellectual tradition of democratic exceptionalism provides the foundation for the book’s “cost distribution theory.” Whereas exceptionalism tends to highlight the “efficiency” of democratic security policies—low defense spending, victory in war, willingness to negotiate—I sought to take the same logic to determine when democracies prepare for, choose, and fight wars unlikely to have such happy outcomes. Democratic Militarism makes the original theoretical argument that, as war becomes an exercise in fiscal rather than social mobilization, a democracy’s median voter can shift the costs of defense away from herself. Wealthy but inequitable democracies will build heavily capitalized militaries and use them aggressively, because arming and war are, in the minds of many voters, cheap. The book draws on extensive microfoundational evidence from public opinion as well as statistical work that links capitalization and economic inequality to aggression. Its novel findings include the novel finding that, analyzing 37 democracies, reveals the lower a poll respondent’s income, the more supportive he or she will be for increased military spending, suggesting an element of redistribution. Poll respondents in the United States and Israel with a lower income level were more inclined to support the use of the military as a tool for foreign policy. Israelis who believed their household expenditure was below average were much less willing to support territorial concessions in exchange for peace. At the level of state behavior, democracies respond to a strategic threat by increasing the percentage of their defense budget devoted to the purchase of equipment. Democracies, unlike non-democracies, with a high level of military capitalization are more likely to attempt a militarized revision of the international status quo. I interpret the roundtable contributions as being largely focused on the book’s theory, particularly the assumptions, rather than empirics. I will confine my response accordingly, but do want to respond to two points about the qualitative chapters. Vennesson finds my empirical cases “one-sided” and “biased.” To this I cheerfully plead guilty. The purpose of the cases is not to definitively explain them; it is safe to say that the British Empire, Vietnam War, and politics of the Middle East are beyond any monocausal understanding. Instead, I chose these cases for two reasons. First, they are tough cases for cost distribution theory. Second, they are important historical cases that had big impacts on international political life, and I seek to show how my theory can help organize important aspects in order for scholars to better understand them. If I did my job right, after reading the book one should not think about these three regions and periods in the same way. I addressed the puzzling fact that massive increases in suffrage (where voting eligibility was based on wealth) preceded the explosion in the late-Victorian British Empire, which most political economic analyses describe as a subsidy to provide economic rents for the wealthy. I next helped answer the puzzle of a consistently flawed ground strategy throughout the U.S. initiation and conduct of the Vietnam War. Rather than the hidebound nature of the U.S. military bureaucracy, deliberate decisions by civilian leaders in three administrations, based on their assessment of the public’s preferences, better explain poor counterinsurgency strategy. I do not disagree with Saunders’ original and important work on the psychological mindset of leaders, which should also change how scholars think about the Vietnam War from now on. However, my theory does a better job of explaining important and consistent aspects of the war’s conduct: personnel appointed, funds appropriated, and doctrine implemented. The final case study, on contemporary Israel, examined the increased capitalization and professionalization of the IDF in tandem with an increase in wealth, inequality, and individualism in Israeli society. I found that civilians’ (and generals’) anticipation of the public’s reaction strongly affected the prosecution of the 2006 war in Lebanon, leading to a largely ineffective campaign. I now turn to the heart of my respondents’ feedback which challenges (or extends) the book’s theoretical foundations rather than its empirical evidence. Does the Voter Matter and How? My argument employs median voter theory (MVT) as a parsimonious way to extend and critique democratic exceptionalism. While some of the public-opinion analyses do leverage the opinion of low-income voters, in general I take the position that those below the median in income distribution do not matter much. I seek to explain middle class wars. For this reason, I actually prefer the informal term ‘average voter’ to capture the actors who matter in my theory. Several roundtable participants correctly point out the empirical weaknesses of MVT. But for my purposes, MVT’s failings, and thus those of cost distribution theory, are conservative ones. If we make the theory more ‘realistic’ (and more complicated) we would see a strengthening of the book’s findings. Vennesson observes that the book’s cover art “left the human presence out of…the idea of war.” The visual analogy is less ironic than Vennesson imagines because the median voter in my story is barely human. While many of our colleagues in political science think that the average voter is rather a dummy, I–like the democratic exceptionalists–endow voters with the best-case scenario of Spock-like powers of reason. In fairness, the theory does not ask all that much of the voter. Given a set of policies, she needs to decide that she likes the amount of taxes she is paying relative to the basket of benefits she receives (or perceives, on which more later). The voter does not have to ‘believe’ in redistribution, or even be aware that a transfer of wealth is occurring. Consider the ‘security theater’ of the Transportation Security Administration, one of the most progressive taxes in the United States. The long lines, uniforms, and fancy machines provide a reassurance to everyone in the airport (if they do not think about it for very long), and the annual vacationer is willing to pay for it, not only in taxes but in the time spent on line. The onerous and largely ineffective security lines in airports clearly affect frequent flyers more than the occasional traveler. What if we allowed the median voter to look more like an actual voter? If we act on Vennesson’s excellent suggestion to incorporate behavioral economics, I suspect we will not find happier results. Humans’ tendencies towards loss aversion and their inability to correctly assess low probability threats suggest that Spock’s replacement will more closely resemble Captain Kirk, only enhancing the militaristic effects identified by cost distribution theory. My respondents invite me to consider other actors. Clearly many other players matter in the politics of democracies. Prior to my book, most diagnoses of militarism in the United States and elsewhere rarely held the average voter accountable. This seemed odd to me given that the voice of the average voter is one of the essential, if not the essential, elements of what makes a regime democratic. Even when accounting for other factors, I find that the “median voter does nonetheless appear to play an important if not exclusive role in shaping democratic policy, and thus any examination of democratic grand strategy must incorporate it” (17). Would this voter think to support wars without the initiatives of institutions and special interests (Coyne) or elite manipulation and signals (Saunders)? Most research finds that voter-initiated conflicts are rare. Instead, I understand my argument as an extension of Jack Snyder’s seminal work, a massive influence on Democratic Militarism, describing “imperial overstretch” as a log-rolling exercise between disparate actors. In a democracy, the average voter is a necessary (if rarely sufficient) participant in this process. Suppose, as is quite plausibly argued by my discussants, that elites do set the terms of the debate and are responsible for putting a military intervention on the agenda. As long as elected officials need to assuage the voter, and no one has convinced me otherwise, then they will need to produce a side payment that minimizes the pain felt by these relatively uninterested actors. The side payments will factor necessarily into the cost-benefit analysis of these interests. And as the price of this side payment goes down thanks to a capital-intensive military doctrine, the cost of going to war for these elites as well as the median voter also drops. As its name suggests, cost distribution theory has little to say about benefits. Indeed, to get the theory going, I assume that arming and war provide public goods, and thus every citizen receives the same benefit from these policies. One of the virtues of this approach is that the “overstated utilitarian assumptions” (to use Vennesson’s phrase) are limited to the costs. This leaves space for a richer understanding in a larger theory of arming and war. The benefits of these policies, which are theoretically held constant in the book, are much more likely to be subject to manipulation by elites and the media. The fact that, in the public opinion data I analyzed, low-income respondents respond in similar ways as wealthier respondents, reassures me that, if there is a version of Snyder’s “imperial myths” doing work, it affects everyone equally (an essential assumption for cost-distribution theory). Nonetheless, how beliefs about the benefits of war are produced needs to be examined in any comprehensive account of militarism, democratic or otherwise. Contrary to Vennesson’s claim, my theoretical voter does not have to be “cynical and selfish;” she only has to factor in the costs to her of pursuing whatever benefits she prizes. These benefits can be the national interest, humanitarian ideals, the desire for her fellow citizens not to die, honor, or revenge. In the empirical section, as Vennesson notes, I do point in the direction of liberal ideology being an important factor, especially in Israel (and, to a lesser extent, late-Victorian Britain), where I describe the transformation of civic life in that country. I suggest that the current militaristic equilibrium in Israel is as much due to a change in the content and political philosophy of Israeli society, as it is to the advent of military technology. In short, ideas about what is security as well as the individual’s relationship to the state, fellow citizens, and the rest of the world need to be essential components of any theory of democracy and war. Finally, Coyne’s welcome speculation on what could be done to avoid democratic militarism points to the importance of ideas about the very nature of the state. His invocation of Buchanan and the pre-constitutional stage of analysis conceives of the state as primarily a shaper of economic activity between individuals. For all my use of Public Choice economics, my conception of the state comes from a different tradition. The association of security, defense, and war as the state’s primary function is a venerable one evoked by Thomas Hobbes, Carl Schmitt, Charles Tilly, and J. Ann Tickner, with powerful political consequences to this day. The provision of security for its citizens is traditionally regarded as the state’s most profound duty, a principal source of its legitimacy, and a means of extracting resources from within its borders. In other research Yanna Krupnikov and I have suggested that even subtle invocations of security have powerful effects on individual policy preferences. I am therefore not optimistic that militarism can be designed out of the state. Reducing economic inequality among its citizens seems to be a somewhat more realistic policy implication here. This idea of the state’s role as security provider helps address the fact that, as all the respondents point out, the empirical evidence for the Meltzer-Richard hypothesis, in which the voter of median income uses government policy to redistribute wealth, is quite mixed. It was gratifying therefore to see the strength of the correlations in the book. I suggest a few reasons why this should not be all that surprising. Why should MVT hold for security policy when it does not appear to hold in other issue areas? First, security might more closely resemble insurance rather than actual transfer of resources from the rich to the poor, a type of government program more likely to receive support from the middle class. Second, there is a strong, perhaps unwarranted, belief, that defense is as close to a pure public good as any government program. One might therefore expect that defense spending would be relatively unadulterated by side payments and special interest rent-seeking. At any rate, it seems clear that discussions of Meltzer-Richard are incomplete without considering defense spending. It may not be a coincidence that the United States’ federal tax system, which lavishly funds the military, is one of the most progressive in the world. Its local tax systems, which inequitably fund education, are not. Third, to my knowledge, little previous research has posited a curvilinear relationship between inequality and government policy. Democracies at the extreme end of the inequality scale appear to be less capitalized and less aggressive than those at the more moderate levels. Several plausible, if ad hoc, explanations exist for this non-linear relationship between inequality and democratic militarism. The first is that when differences between rich and poor are very large and per capita income is modest, even the median voter is likely to be extremely poor. The marginal benefit of a even a tiny reduction in the tax burden will likely outweigh the benefits of a larger military effort or of a more aggressive, riskier grand strategy. Alternatively, democracies with extreme economic inequality (well beyond the United States’ level) may also be relatively new democracies and thus may be unsure of the extent of civilian supremacy over the military. Finally, highly unequal democracies may not be all that democratic; the wealthy enjoy an oversized amount of political power, making the polity more oligarchic. The Democratic Difference: Elites are Everywhere. Voters are Not. I focus on the average voter above all others because that is what distinguishes democracies from non-democracies. Saunders cites an array of outstanding research that suggests that exceptionalism might be exaggerating the differences between democracies and non-democracies. When viewed on a highway there is little distinction in the behavior of electric and internal combustion cars. But their internal differences—battery size, heat generation, driver smugness—mean that how these vehicles operate, and break down, differs in significant and important ways. For this reason democracies (as well as the varieties of non-democracies) still merit separate study. It is for this reason that I used a term, “militarism,” that is traditionally associated only with non-democracies. Previously militarism has generally been conceived of as a civil-military relations crisis, a rare but dangerous situation in which the military penetrates the very fabric of society and dominates the civilian government in terms of foreign policy decision-making. This unnecessarily limited definition conflates militarism as an outcome with the process causing it. If a hallmark of democracy is civilian dominance of the military, “democratic militarism” becomes an oxymoron. My theory suggests that militarism remains feasible in a state where its military has little connection to society yet remains entirely dominated by the voters’ civilian representatives. Indeed, in a democracy this is a prerequisite. Identifying correlations linking inequality to policy preferences and state behavior is a novel empirical finding that lends confidence to the larger theory’s implications (many parts of which are harder to test statistically). Moreover, economic inequality has received massive amounts of intellectual attention lately. But in terms of politics I think that military doctrine is more important. Thanks to the materiel of modern war, for wealthy contemporary democracies the costs of conflict are low for everyone. They are lower still for the majority relative to the wealthy. Like Vennesson, I am fascinated by long-term processes on international politics. And indeed, there is plenty of evidence that my two explanatory variables–economic inequality and military capitalization–are related aspects of long-term social and economic processes that affect all countries, not just democracies. Lake makes a case for why “autocracies are likely in [his] view to remain even more aggressive” for reasons of Meltzer-Richard “in reverse.” But modern war is expensive. Keeping up with the West on this front will require vast investments. Russia is embarking on a massive military modernization program. China is attempting to copy American stealth fighters from stolen blueprints. Every major country has multiple drone development programs regardless of regime type. The problem with funding war by taking from the poor is that they have very little money. Moreover, the empirics in Chapter 4 do suggest that democracies are systematically more aggressive given increases in capitalization relative to non-democracies. I am honored by and grateful for such serious feedback from such serious scholars. All of the respondents have made clear that Democratic Militarism cannot be the last word on the subject. My theory, like all theories, exhibits many explanatory gaps. But I do argue that cost distribution theory exposes the even greater shortcomings of its predecessors. Given trends in international politics, I will wager that the book’s approach will explain a lot more than its current rivals for the foreseeable future. Call me Ishmael, as I am content to be an observer of that particular intellectual conflict. This is because, given the regime types of the most important and active international actors, the prospect of peace between democracies matters little for contemporary great power politics. Turning to current conflicts around the world, many of the recent capital-intensive, ineffective wars fought by democracies are motivated in part by the same logic that drives the dyadic liberal peace. Many bloody conflicts not directly involving democracies, such as in sub-Saharan Africa, have received an influx of weapons, training, and money from the liberal West in an updated version of the Nixon Doctrine (which epitomizes cost distribution theory). If liberal impulses remain while the costs of democratic war drop, cost distribution theory’s implications for contemporary politics are both more pertinent and more pessimistic than those of the dyadic democratic peace hypothesis. In responding to Lake I am therefore inclined to channel North Vietnamese Colonel Tu’s famous retort to his American counterpart’s claim that “you never defeated us on the battlefield.” That may be so, but it is also irrelevant. Allan H. Meltzer and Scott F. Richard, “A Rational Theory of the Size of Government,” The Journal of Political Economy 89:5 (1981): 914-927. On selectorate theory, see Bruce Bueno de Mesquita, et al., The Logic of Political Survival (Cambridge: MIT Press, 2003). Among others, see Miguel Gouveia and Neal Masia, “Does the Median Voter Model Explain the Size of Government? Evidence from the States,” Public Choice 97:1-2 (1998): 159-77; Francisco C. Rodríguez, “Does Distributional Skewness Lead to Redistribution? Evidence from the United States,” Economics and Politics 11:2 (1999): 171-99; Branko Milanovic, “The Median-Voter Hypothesis, Income Inequality, and Income Redistribution: An Empirical Test with the Required Data,” European Journal of Political Economy 16 (2000): 367-410; Karl Ove Moene and Michael Wallerstein, “Earnings Inequality and Welfare Spending: A Disaggregated Analysis,” World Politics 55:4 (2003): 485-516; Jo Thori Lind, “Why Is There So Little Redistribution?” Nordic Journal of Political Economy 31 (2005): 111-125; and Lane Kenworthy and Leslie McCall, “Inequality, Public Opinion and Redistribution,” Socio-Economic Review 6, 1 (2008): 35–68. H.L. Mencken, A Little Book in C Major (New York: John Lane Company, 1916). The theory assumes that alternatives can be mapped along a one-dimension continuum and that voter preferences are single peaked. Caverley discusses why these assumptions are likely to be met in the context of foreign intervention. John Mueller, Overblown: How Politicians and the Terrorism Industry Inflate National Security Threats, and Why We Believe Them (New York: Free Press, 2006). Michael J. Glennon, National Security and Double Government (New York: Oxford University Press, 2015). For a useful summary, see Michael C. Desch, “Democracy and Victory: Why Regime Type Hardly Matters,” International Security 27:2, 5-6. Important work in this area includes David A. Lake, “Powerful Pacifists: Democratic States and War,” American Political Science Review 86:1 (March 1992): 24-37; Dan Reiter and Allan C. Stam, Democracies at War (Princeton: Princeton University Press, 2002); Bruce Bueno de Mesquita, Alastair Smith, Randolph M. Siverson, and James D. Morrow, The Logic of Political Survival (Cambridge: MIT Press, 2003). The literature on democracies and war is vast, and includes many critiques of the “democratic advantage” thesis. See, for example, Desch, “Democracy and Victory”; Alexander B. Downes, “How Smart and Tough Are Democracies? Reassessing Theories of Democratic Victory in War,” International Security 33:4 (Spring 2009): 9-51; and the H-Diplo/ISSF Exchange on Democracy and Victory, 1 July 2011, https://issforum.org/ISSF/PDF/ISSF-Roundtable-2-12.pdf. See, for example, Desch, “Democracy and Victory”; Downes, “How Smart and Tough Are Democracies?”; Alexander B. Downes and Todd S. Sechser, “The Illusion of Democratic Credibility,” International Organization 66:3 (July 2012): 457-489; Jason Lyall, “Do Democracies Make Inferior Counterinsurgents? Reassessing Democracy’s Impact on War Outcomes and Duration,” International Organization 64:1 (Winter 2010): 167-192. Jessica L.P. Weeks, Dictators at War and Peace (Ithaca: Cornell University Press, 2014); Caitlin Talmadge, The Dictator’s Army: Battlefield Effectiveness in Authoritarian Regimes (Ithaca: Cornell University Press, 2015). Others have examined related aspects of authoritarian foreign policy decisions: see, for example, Jessica Chen Weiss, Powerful Patriots: Nationalist Protest in China’s Foreign Relations (Oxford: Oxford University Press, 2014). Matthew A. Baum and Philip B.K. Potter, War and Democratic Constraint: How the Public Influences Foreign Policy (Princeton: Princeton University Press, 2015); see also Philip B.K. Potter and Matthew A. Baum, “Looking for Audience Costs in All the Wrong Places: Electoral Institutions, Media Access and Dispute Reciprocation,” Journal of Politics 76:1 (January 2014): 167-181. John M. Schuessler, Deceit on the Road to War: Presidents, Politics, and American Democracy (Ithaca: Cornell University Press, 2015). In my own research, I have argued that elites are often the proximate audience for decisions for war, even in democracies. See Elizabeth N. Saunders, “War and the Inner Circle: Democratic Elites and the Politics of Using Force,” Security Studies 24:3 (September 2015): 466-501. In the context of war, see Adam J. Berinsky, In Time of War: Understanding American Public Opinion from World War II to Iraq (Chicago: University of Chicago Press, 2009). See, for example, John H. Aldrich, Christopher Gelpi, Peter Feaver, Jason Reifler, and Kristin Thompson Sharp, “Foreign Policy and the Electoral Connection,” Annual Review of Political Science 9 (2006): 484-486. See Elizabeth N. Saunders, “Transformative Choices: Leaders and the Origins of Intervention Strategy,” International Security 34:2 (Fall 2009): 119-161; and Elizabeth N. Saunders, Leaders at War: How Presidents Shape Military Interventions (Ithaca: Cornell University Press, 2011), chs. 4-5. Among the many who have argued that the military preferred a firepower-intensive military strategy, see Andrew Krepinevich, The Army and Vietnam (Baltimore: Johns Hopkins University Press, 1986). On public opinion and Vietnam, see John Zaller, The Nature and Origins of Mass Opinion (Cambridge: Cambridge University Press, 1992), ch. 6; Berinsky, In Time of War, 111-118. Colin McInnes, Spectator-Sport War: The West and Contemporary Conflict (Boulder: Lynne Rienner, 2002); Theda Skocpol, Diminished Democracy. From Membership to Management in American Civic Life (Norman: University of Oklahoma Press, 2003); Gil Merom, How Democracies Lose Small Wars: State, Society, and the Failures of France in Algeria, Israel in Lebanon, and the United States in Vietnam (Cambridge: Cambridge University Press, 2003); Yagil Levy, Israel’s Death Hierarchy: Casualty Aversion in a Militarized Democracy (New York: New York University Press, 2012). For example, I would submit that his argument is more about bellicism understood as an inclination to war and warlike policy and behavior, than militarism as such, which refers to the predominance of the military and its ideals, the exaltation of military virtues and ideals and can include military preparedness but not necessarily the actual use of force. A democratic society can perfectly be non-militaristic and yet bellicist (see the conceptual discussion, 3). Albert O. Hirschman, Exit, Voice, and Loyalty: Responses to Decline in Firms, Organizations, and States (Cambridge: Harvard University Press, 1970), 19-20.
. Robert Putnam, Bowling Alone: the Collapse and Revival of American Community. New York: Simon and Schuster, 2000; Theda Skocpol, Diminished Democracy: From Membership to Management in American Civic Life. Rothbaum Lecture Series. Norman: University of Oklahoma Press, 2003.
. Ian S. Lustick, “History, Historiography, and Political Science: Multiple Historical Records and the Problem of Selection Bias,” The American Political Science Review 90:3 (September 1996), 605. Max Boot, “The New American Way of War,” Foreign Affairs 82:4 (2003): 41–59. TM Moseley, Operation IRAQI FREEDOM – By The Numbers (Ahw AFB, S.C., 2003), http://www.afhso.af.mil/topics/factsheets/factsheet.asp?id=18635. U.S. Air Forces Central Command, “Airpower Summaries.” http://www.afcent.af.mil/AboutUs/AirpowerSummaries.aspx. Alexa O’Brien, “AFCENT CFACC Airpower Summaries and Statistics 2001 to Present,” http://alexaobrien.com/afcent-cfacc-airpower-summaries-and-statistics. Elizabeth N. Saunders, Leaders at War: How Presidents Shape Military Interventions (Ithaca: Cornell University Press, 2011). Perhaps even more importantly, do political elites act as if the voter matters? That is why in the cases I focus on elite deliberation over both doctrine and public opinion. Nate Silver, “The Hidden Costs of Extra Airport Security,” FiveThirtyEight, New York Times, 2010, http://fivethirtyeight.blogs.nytimes.com/2010/11/18/the-hidden-costs-of-extra-airport-security/?partner=rss&emc=rss&_r=0. Jeffrey Taliaferro, Balancing Risks: Great Power Intervention in the Periphery (Ithaca: Cornell University Press, 2004). John E Mueller, Overblown: How Politicians and the Terrorism Industry Inflate National Security Threats, and Why We Believe Them (New York: Free Press, 2009). James Tiberius Kirk, the captain of the USS Enterprise, was the more emotional “human” counterpoint to Spock. Importantly, given my book’s argument, Kirk never pays the cost of his hotheadedness, which is passed on to the doomed red-shirted ensign that inevitably accompanies him on his adventures. John Scalzi, Redshirts: A Novel with Three Codas (New York: Tor Books, 2013). Chalmers Johnson, The Sorrows of Empire: Militarism, Secrecy and the End of the Republic (New York: Henry Holt, 2004); Andrew Bacevich, The New American Militarism: How Americans Are Seduced by War (New York: Oxford University Press, 2005); Michael Mann, “Delusions of Empire,” Socio-Economic Review, 2004, 1–13. Elizabeth N. Saunders, “War and the Inner Circle: Democratic Elites and the Politics of Using Force,” Security Studies 24 (2015): 466-501. Jack L Snyder, Myths of Empire: Domestic Politics and International Ambition (Ithaca: Cornell University Press, 1991). Rachel M. Stein, “War and Revenge: Explaining Conflict Initiation by Democracies,” American Political Science Review 109 (2015): 556-573. Jonathan Caverley and Yanna Krupnikov, “Aiming at Doves: Experimental Evidence of Military Images’ Political Effects,” Journal of Conflict Resolution, forthcoming. K.O. Moene and M. Wallerstein, “Inequality, Social Insurance, and Redistribution,” American Political Science Review 95:4 (2001): 859-74. Although goodness knows there is plenty of that! Monica Prasad and Yingying Deng, “Taxation and the Worlds of Welfare,” Socio-Economic Review 7:3 (2009): 431–57. Caitlin Talmadge, The Dictator’s Army: Battlefield Effectiveness in Authoritarian Regimes (Ithaca: Cornell University Press, 2015). Jessica L.P. Weeks, Dictators at War and Peace (Ithaca: Cornell University Press, 2014). Jonathan D Caverley, “Paying for Israel’s Wars,” Monkey Cage: A Washington Post Blog, 2014, http://www.washingtonpost.com/posttv/world/the-israeli-palestinian-conflict- explained/2014/07/24/3895a6b6-1372-11e4-ac56-773e54a65906_video.html . Robert S. Litwak, Détente and the Nixon Doctrine American Foreign Policy and the Pursuit of Stability, 1969-1976 (Cambridge ; New York: Cambridge University Press, 1986); Barack Obama, “Remarks by the President at the United States Military Academy Commencement Ceremony” (West Point, 2014), https://www.whitehouse.gov/the-press-office/2014/05/28/remarks-president-united-states-military-academy-commencement-ceremony . Harry G Summers, On Strategy: A Critical Analysis of the Vietnam War (New York: Presidio Press, 1982).